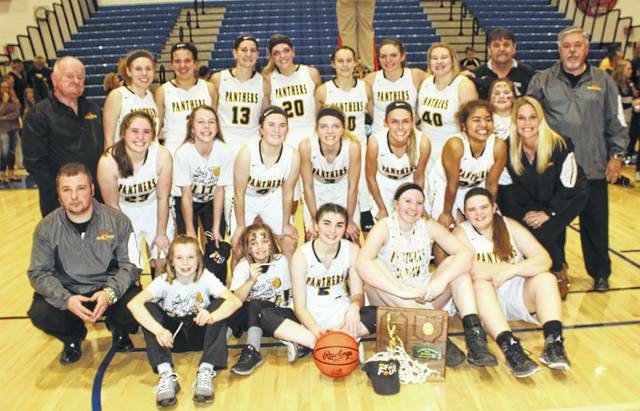 MIAMI TRACE LADY PANTHERS 2017 REGIONAL CHAMPIONS — The Miami Trace Lady Panthers gather on the court at Zanesville High School after winning the Division II Regional championship, 30-28 over Dresden Tri-Valley Friday, March 10, 2017. Miami Trace seniors (l-r) Tori Riley, Samantha Ritenour and Hanna Reisinger accepted the Regional championship trophy after a 30-28 win over Dresden Tri-Valley Friday, March 10, 2017 at Zanesville High School. Miami Trace sophomore Cassidy Lovett drives along the baseline during a Division II Regional championship game against Dresden Tri-Valley at Zanesville High School Friday, March 10, 2017. Also pictured for Miami Trace is freshman Shaylee McDonald. Pictured for Tri-Valley is freshman Lauren King (15). ZANESVILLE — The Miami Trace Lady Panthers have made more school history, capturing the 2017 Regional championship here Friday night with a 30-28 win over Dresden Tri-Valley. Miami Trace, now 24-4, will play the winner of Saturday’s game between Hathaway Brown School and West Branch on Thursday, March 16 at 3 p.m. at the Schottenstein Center on the campus of The Ohio State University. This game was another defensive struggle (as was the Regional semifinal against New Philadelphia) by both teams with scoring at a premium. Miami Trace was led by junior Tanner Bryant with 14 points. For the second game in a row, Bryant was the only player in the game to reach double figures. Senior Hanna Reisinger scored seven for Miami Trace, including both of the Lady Panthers’ two three-point field goals. Junior Victoria Fliehman scored five points and sophomore Cassidy Lovett had four points. 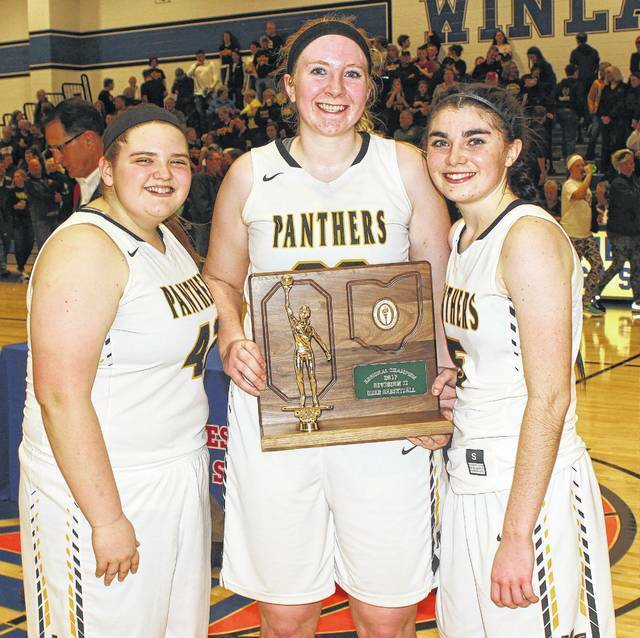 For Tri-Valley, finishing the season with a record of 20-7, junior Alivia Bash, sophomore Laiken Little and freshman Audrey Spiker shared team scoring honors with six points each. Freshman Kyndal Howe and freshman Lauren King both scored four points and junior Alysa Edwards-Frick scored two. Folks have not heard the last from Tri-Valley as this talented team has no seniors. Miami Trace fell behind 11-4 with 1:23 to play in the first quarter. That was the score at the end of the first quarter in front of a full gymnasium at Zanesville High School. The second quarter brought Miami Trace right back into the thick of things. 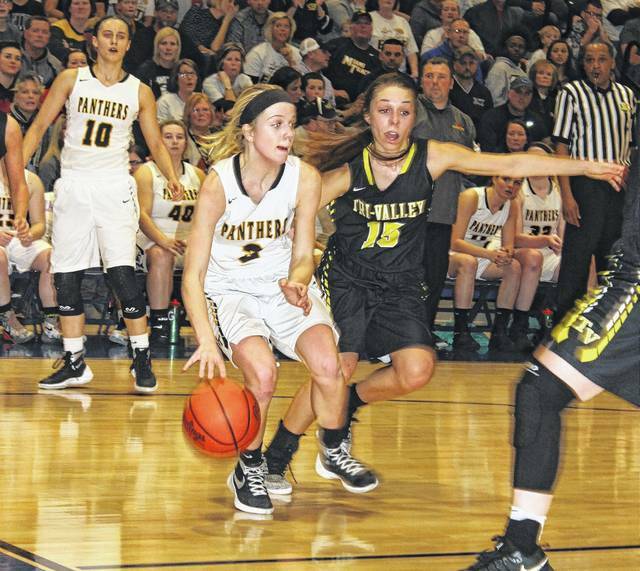 The Lady Panthers scored 10 points in the second, while shutting out Tri-Valley. Reisinger hit a three, which was followed by a basket from Lovett, who followed her own miss, got the rebound and scored. Fliehman scored to tie the game, 11-11 with 4:40 to play until halftime. Reisinger hit another three to give Miami Trace a 14-11 lead. The final two-plus minutes of the second quarter were scoreless leaving the Lady Panthers with a 14-11 advantage at the break. The third quarter saw the defensive battle continue. Tri-Valley finally broke the ice with the first bucket of the second half, their first basket since the 1:23 mark of the first quarter, when they scored with 2:48 to play in the third. Fliehman scored with 1:47 to go in the third, putting Miami Trace in front, 16-13. Reisinger hit a free throw and Bryant scored with 18 seconds to play in the third, giving Miami Trace a 19-15 lead, which was how the score stood heading into the fourth quarter. To begin the fourth quarter, a technical foul was called on Tri-Valley. Miami Trace could not capitalize at the foul line. Tri-Valley scored to pull to within two points, 19-17, with 6:09 remaining. The teams exchanged baskets and then Fliehman hit a free throw and Bryant scored to give Miami Trace its biggest lead at 24-19 with 4:23 to play in the game. Tri-Valley hit back-to-back threes, one from Bash and one from Little, sandwiched around a lay-up from Bryant. Bryant hit another basket to keep Miami Trace in front, 28-25 with 2:30 left to play. After a lull in the offense for both teams, Tri-Valley scored to pull to within one, 28-27 with 57 seconds on the scoreboard clock. With 41.9 seconds to play, Bryant was fouled and sank two free throws. Tri-Valley missed a shot and fouled. Miami Trace missed those two free throw attempts. Holding dearly to a three-point lead, Bash was fouled attempting a three-point basket with 1.3 seconds to go to State. She missed the first shot, made the second and missed the third intentionally. Miami Trace got the rebound and the celebration began. “I don’t know what to say except this is a program win,” Miami Trace head coach Ben Ackley said while holding the game ball. “This goes to every kid that’s ever worn a jersey that says Miami Trace on it. We’ve got a lot of (former players) here tonight. This is about way more than just us. “But I couldn’t be more proud of our kids and our fans and, just everybody,” Ackley said. “I’m very thankful. “We thought that we could be effective pressuring them out front,” Ackley said. “You would think that we weren’t ready for what they did on defense. We knew they were going to run multiple defenses. Our kids have played in front of big crowds, but nothing like this. This was an environment I’ll never forget. “We just didn’t focus, didn’t do a very good job, offensively,” Ackley said. “We’re still struggling at the foul line. I promise you, we’re shooting them every day. This was for the Final Four. The other night was to get to the Elite Eight. Those are situations I can’t put them in in practice. MIAMI TRACE — Olivia Wolffe 0-0-0; Cassidy Lovett 2-0-4; Hanna Reisinger 0 (2)-1-7; Shaylee McDonald 0-0-0; Morgan Miller 0-0-0; Victoria Fliehman 2-1-5; Tanner Bryant 5-4-14; Samantha Ritenour 0-0-0. TOTALS — 9 (2)-6-30. Free throw shooting: 6 of 13 for 46 percent. Three-point field goals: Reisinger, 2. Combined field goal shooting: 11 of 31 for 35 percent. Three-point field goal shooting: 2 of 11 for 18 percent. Turnovers: 9. Rebounds: 19 (3 offensive). Assists: 6. Steals: 3. Personal fouls: 11. TRI-VALLEY — Kyndal Howe 1-2-4; Laiken Little 0 (2)-0-6; Alivia Bash 1 (1)-1-6; Audrey Spiker 3-0-6; Lauren King 0 (1)-1-4; Gabee Bryan 0-0-0; Alysa Edwards-Frick 1-0-2; Breanna Hines 0-0-0. TOTALS — 6 (4)-4-28. Free throw shooting: 4 of 8 for 50 percent. Three-point field goals: Little, 2; Spiker, King. Combined field goal shooting: 10 of 29 for 34 percent. Three-point field goal shooting: 4 of 9 for 44 percent. Turnovers: 16. Offensive rebounds: 4.